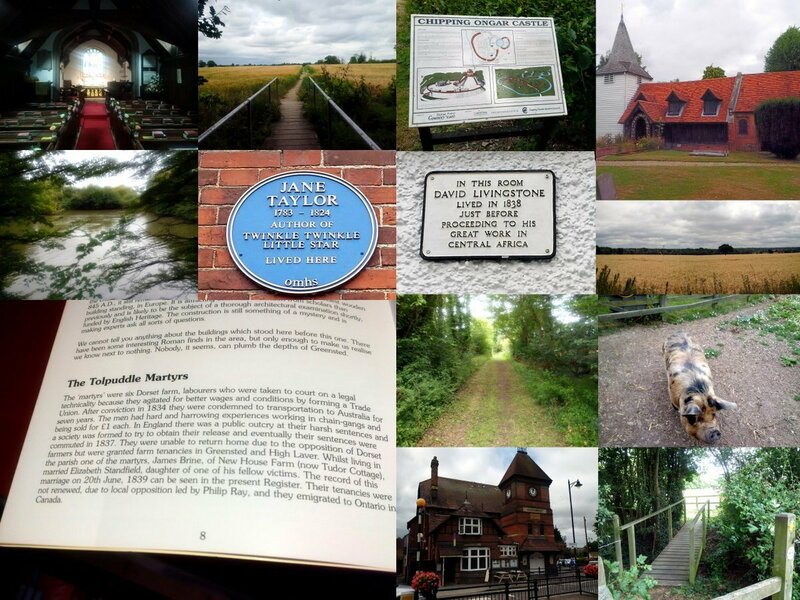 On Sunday 16 July Sunday 2017 during the annual Tolpuddle Martyrs weekend, I went for a walk with Gill in Chipping Ongar and Greensted to visit the wooden Saxon Church and pay homage to the Tolpuddle Martyrs who were resettled in farms around here, after they were released from transportation to Australia. It is a lovely part of the world and the Church is just amazing. It is also thought to be the oldest wooden Church in the world and the oldest wooden building standing in Europe. One of the Tolpuddle Martyrs, James Brine (I used to manage James Brine House in Bethnal Green as a Council housing officer) married the daughter of another of the victims, Elizabeth Standfield, here on 20 June 1839. The Martyrs were driven out of the area due to opposition due to the local Rector and they emigrated to Canada. The walk was about 9 miles (we got a little lost) but it was a good planning event for next year, so any supporters of the Tolpuddle Martyrs, who cannot get to Dorset that weekend may want to join us on a walk to Greensted. The starting point of the walk in the village of Chipping Ongar is also well worth a visit.